This tutorial was written to help moderators perform common moderation tasks on this website. It is public and everyone can read it, but it is primarily targeted at moderators. This tutorial explains your different roles as a moderator. Prevent conflicts, fight spam... act against anything that is bad for the community, the website or the project. As a moderator you're the first point of contact and you represent the project and the team to the community. Welcome and help people as much as you can. Within the Linux Mint project, the community is as important as the operating system itself. You make the community what it is, its ambiance, the comfort, the fun and the feeling of being at home that users can get. There will be bugs in the OS and there will be issues in the community, but with the dev. team working hard on the product and you making things better in the community, we're all contributing to making things better for Mint users. This is extremely important. As an open source project, the quality of our community and the relationships within its members are one of our most precious assets. With such a large community, it's extremely hard for a user to catch the developpers attention, and it's almost impossible for the development team to follow everything that is going on within the community. When you spot something interesting, forward it to the dev. team. Similarly, keep an eye out in the forums and in the testing module to know what is going on within the dev. team and don't hesitate to inform people within the community. A lot of the information available on this website is contributed by the community. When a particular piece of information isn't categorized correctly it makes it harder for people to find relevant info. From the tutorials page you can see the number of tutorials "awaiting review". These tutorials need your attention. You can list them using the search by selecting the format "awaiting review". It doesn't matter whether the text was written by the author or copied and pasted there, and it doesn't matter whether the link to a PDF is direct or not. What you're doing here is classifying the tutorials according to what format they're in. Initially, users could create brands and categories of hardware. This is no longer possible and they need to choose existing values for these. The brand should be a company name.... or "Other", not a device name. There is no stats available to help you find incorrect entries and help you clean the database... but you can look in the combo boxes in the search to find suspicious looking brands and types and list devices using name. Important info: Every time you review or delete a device, all brands and types which aren't used by any device anymore get deleted from the database. So, by reviewing devices you also clean up the brands and types tables. This is a tough task because all ideas are appreciated but only a few get implemented. Some ideas are good, some ideas are bad, some ideas are good but difficult to implement...as a moderator it's your job to bring the best and most feasible ideas to the top of the list so that developers can easily look at them and make a difference. Would implementing it be a plus for Linux Mint? Could the developers allocate the resources necessary for the implementation? Ideas which match these two criterias should find their way to a developer and that's the main reason the idea module was created. The other aspect of this is user contribution. Whether it's a bad idea or a good idea which doesn't fit the direction of the Mint project or even a good idea which fits it but is hard to implement, it's important authors understand their idea is appreciated. Statuses are described in an effort to underline this appreciation. So for instance, a bad idea and an idea that is good but unlikely to be implemented get the same status, and this status isn't "rejected", but "considered". The fact that an idea is good or bad isn't important, what's important is that we appreciated it being submitted and that we assessed whether we were planning on implementing it. Moderators are encouraged not to comment ideas or discuss them with their authors, unless they seek clarification or missing content. As a moderator you're responsible for the progression of the idea and you assess its status. Authors necessarily think their idea should be implemented since they submitted them in the first place. It is not your place to agree or disagree with them, but simply to change their status according to your own ability so that they either get processed or get highlighted to the developers. The graph at http://community.linuxmint.com/img/statuses.jpg describes the different statuses. 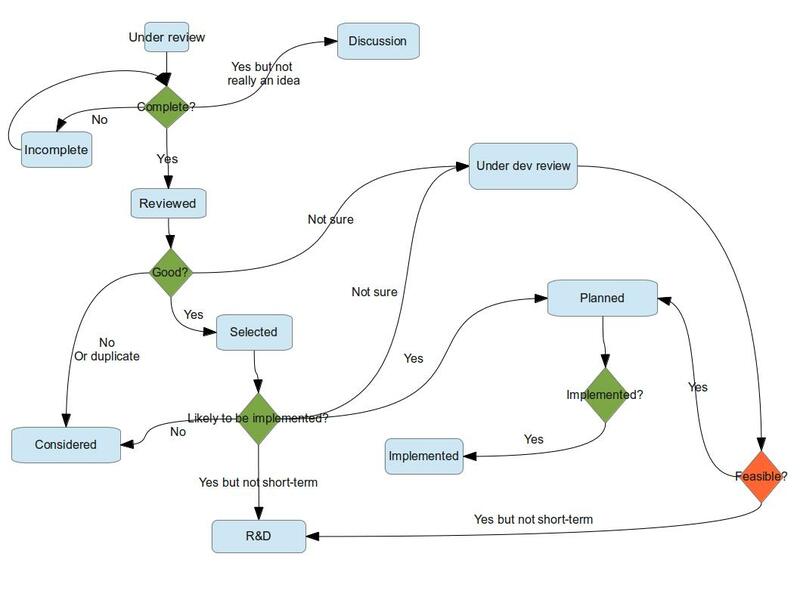 In the graph, the decision appearing in orange is done by a developer. Exact duplicates can be deleted (if somebody double-posted by mistake for instance), whereas ideas which express similar content should be marked as "considered". I have difficulties to contact the french Linuxmint fr org community. I get a message asking for a password but with my usual password since 2009 it doesn't work ! Any idea of the situation there? it seems the site is closed or something related ! terabyte	 I'm not a moderator on the Mint Community though I have been a moderator and in two cases an administrator (owner) of a Bulletin Board like Mint's own community which served some five millions of people across the globe. The instructions given here are absolutely excellent and I wish I had had them when I was a moderator as I had to learn the hard way! If I could award points I would give this moderator instruction 20 out of a possible 10 - that is the awards are greater than any possible number that may be cognisant with this view. Terabyte. clem	 OK, all merged, all done. In the"Brand" category can you merge "HP" and "HP (Hewlett-Packard)"
You could merged "Graphic Card" with "Graphics Card (VGA)" and "CPU/Processor" with "Processor" too. "USB Storage","USB Flash Drive","USB Pendrive","Storage device(Hard Drive,Flash,USB stick)","External USB Harddrive","External Hardisk" could all be merged. clem	 They should be merged indeed. If you make a list of the categories that need merging I can run queries directly in the database and update the entries in batch. oscar799	 Clem,I know this has been mentioned elsewhere but there are some confusing categories on the Hardware DB eg. Laptop/notebook and separate categories called "laptop" and one called "notebook"
Can these be merged somehow? clem	 @remoulder: We could add this later on. In the meantime users can contact mods directly via PM. @kazztan0325: I looked at this idea last week, it's good but hard to implement. I'll look at it again in the future and see if we can improve things a bit. The recent series of improvements came from the review of compuman's other ideas. oscar799	 Clem,When Moderators edit entries on the Hardware Database,the "Brand" dropdown menu doesn't seem to be in alphabetical order,making it harder to find the right entry. kazztan0325	 I was interested in the topic 'Communication', though this article is written for moderators. I think, for realizing the communication (Community Members <==> Moderators <==> Dev Team) easily, it would be good if @compuman2004 's idea 'Moderator Response Section on Community Home Page' would be implemented. remoulder	 Clem, I feel it would be useful to have a direct way for users to alert moderators regarding a post rather than waiting for it to be reviewed. Perhaps something similar to the alert system used in the forums?